Fantastic Contraption really challenges you to use your mind in ways most of us probably haven’t since our last physics class. There are 43 levels to complete, which even for the most brilliant among us, will take quite a long time. The goal in each level is to get the pink shape into the pink box. You do this by building a contraption to get it there. Your only tools to build your contraption are 3 different types of wheels and 2 different types of rods to connect the wheels. You only have the pre-designed workshop area in which to build your contraption, which limits the size of your contraption. When you think that you have something that will work, tap the “start” button and your contraption will run. When you are ready to stop the contraption, tap the “stop” button and the contraption will return to the workshop where it started. At first, completing a level seems easy. The first couple of levels only require that you add a pair of wheels to the shape to move it to the goal. Very quickly it gets more difficult however, as obstacles are placed in your way. It actually takes a lot of trial and error work to discover what combination of wheels and rods will accomplish the task. You must learn from every mistake that you make and improve on your design. If a particular level has you stumped, you can always return back to the menu and choose another level to work on. The game will remember the last design that you were working on. You can come back later and try again. If you complete a level in an exceptional way, you can earn one of several badges. These badges include one for completing each level in one of the following ways: without using any powered wheels, without using any wheels, returning all the blocks to the workshop area, making all the blocks fall out of the level, and keeping all the blocks in the goal area. Most of these tasks require special forethought when you are designing your contraption to accomplish. To help you get a feel for the game and the tools, there are a few tutorials, which were somewhat helpful to me. However, even after watching the tutorials, I was confused about how some of the things worked. I ended up just playing around with it to figure things out for myself. I also found building and refining my contraption to be slow, tedious work. This game is not one to play quickly to kill a few moments here and there. It takes a lot of time and thought. Each contraption becomes a project in and of itself. The hard work does pay off when you finally reach your goal, though. You can save your contraptions and upload them to share with others. You can also download other people’s contraptions and rate them. 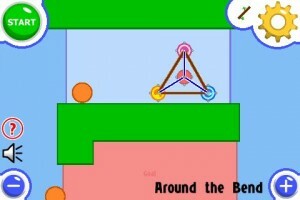 You can also create your own levels and try to solve them. To use these online features, though, you must first create an account. Fantastic Contraption presents a challenging puzzle that can be fun and rewarding. The graphics are simple. The goal is simple. The achievement of the goal is hard. For me, it was a little too arduous to really be called a game. Fantastic Contraption is $4.99 in the iTunes App Store. and iPhone news in your email inbox!